If you love entertaining at home and hosting dinner parties, you need to know how to set an elegant table. Begin by learning how prepare a formal table setting you can leave set up in a formal dining room or use for special occasions such as weddings, anniversaries and holidays. After that, you can get creative with your own custom 'tablescape' ideas. A formal table setting starts with the basics, which includes five standard flatware pieces and five standard dinnerware pieces. The silverware should be set so that the guest works their way from the outside in - salad fork on the outside, then dinner fork. If you have knives for each course, follow that same pattern. Forks go on the left, knives on the right. If you have a simple one fork/one knife setting, you can choose between putting one on each side or putting them both on the left, side by side. Salad plates can be placed on top of the dinner plate, or you can have the salad plate at the center of the setting and remove it after the salad course, replacing it with the dinner plate. 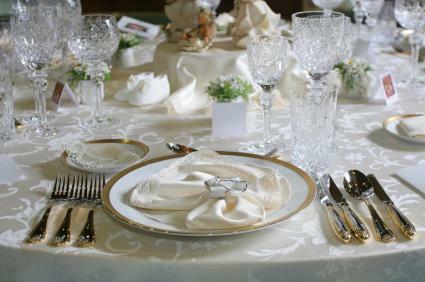 If you have a dessert set of flatware, the spoon/fork should go at the top center of the setting. Fresh flowers brighten a table setting beautifully, and they provide an impressive display with great attention to detail. Two to three centerpieces placed in the middle of the table will fill the room with color. Anchor the flowers in small containers with floral foam to keep them fresh. This will make the flowers appear to be resting right on the table. Fill in the centerpiece with baby's breath, filler greens and decorative accessories such as crystal or pearl sprays and/or feathers. 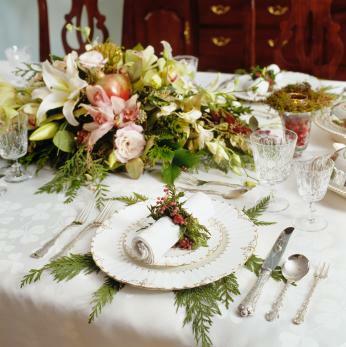 Place some of the filler greens under each place setting to tie the floral centerpieces in with the place settings. Use some of the other decorative accessories in the centerpieces as napkin rings. An additional idea involves using plastic stemware to create small, individual centerpieces for each place setting. Place the fresh flower centerpiece on each plate and add a floral gift tag with each person's name. Allow your guests to take their centerpieces home. Host an Asian-themed dinner party and serve your favorite type of Asian food. If you like sushi and sake, prepare an elegant table setting with a minimalist, Japanese style spread. Create modest table centerpieces by filling glass vases with water, a few polished rocks and a couple pieces of lucky bamboo, or place a few cherry blossom branches in an Oriental style vase. 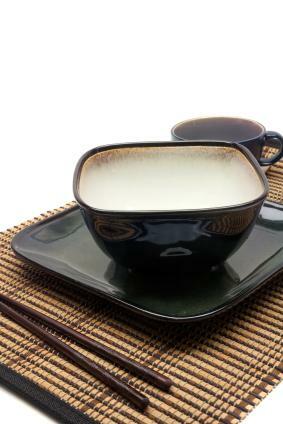 Place bamboo placemats at each setting. Add pieces of Oriental dinnerware according to what is being served, such as a rice bowl, soup bowl, appetizer plate and dinner plate. Include chopsticks and a soup spoon. Set out a sake set and a tea set. Use a bamboo turntable to hold the sushi, rice and entrees so that guests can easily serve themselves. If the table is large enough, add a second turntable for the sake and tea. Give your table an island look and feel with a tropical table setting. Create a tropical centerpiece with orchids, bromeliads or birds of paradise grouped with tropical fruit such as pineapple, banana, coconut and mango. Another option is to fill glass vases or bowls with citrus fruits such as oranges, lemons and limes. Use whole fruit and round slices. Surround the containers with silk hibiscus flowers. Add artificial greenery such as palm leaves, split philodendron, fern or calla lily leaves. Use round, raffia placemats at each setting. 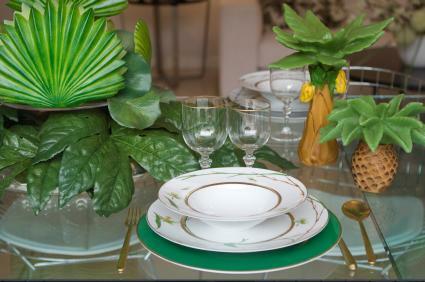 Place colorful, tropical-themed dinnerware at each place setting. Enhance the mood with tabletop tiki torches or a tabletop firepit. Create an intimate setting for two with only a few decorative accessories. Place several red roses in a vase. Surround the vase with red or burgundy candles in varying sizes. Place a bottle of red wine or a small ice bucket with champagne or wine nearby. Scatter rose petals around the table. 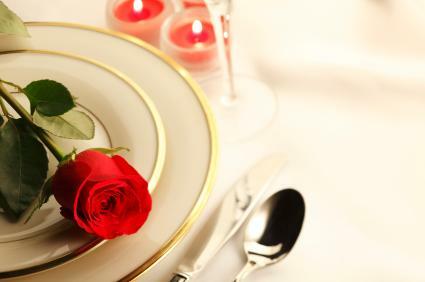 Place a single rose on each plate. Create an elegant and attractive, color-coordinated table setting. Use colors with a strong contrast for a display that really stands out. Black makes a good background color since other colors pop when placed against it. Other dark colors such as burgundy or navy also work well when paired with brighter colors such as gold, yellow, red or orange. Choose two to three contrasting colors such as black and gold, burgundy and gold, navy and yellow or red, white and black. Cover the table with a dark tablecloth, table runner or placemats. Add bright accessories such as candles, flowers, fruit, napkins or brightly colored tableware to contrast with the dark background. An ocean-themed table setting is perfect for a seafood dinner, a coastal home or a summertime tablescape. Use ocean inspired table linens in colors of light blue, light green or coral. 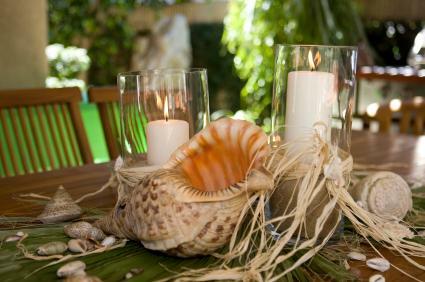 Place a clamshell filled with sand and a tea light at each place setting. Create a stunning table with an impressive display of candles. Unify the look with similar colors or materials. Use a combination of glass candle holders, jars, lanterns and hurricane shades for a shimmering candlelight table. Fill a glass bowl with glass beads and insert several round candles. Create an organic display with natural materials such as tree branch or log candle holders, pine cones, and an assortment of spices such as dried oranges, vanilla beans and cinnamon sticks. For a Gothic table, use black lace as a table runner and place several wrought iron candelabras on it. Fill the bottom of wine glasses with black glass beads and insert small votive candles. 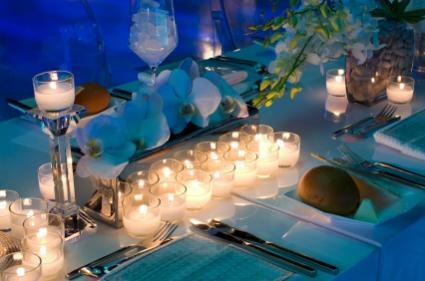 Add a few more small votives and tea lights in colors of black, burgundy and dark purple throughout the table. Create a floating candle display by filling an assortment of glass vases, stemware and bowls in varying sizes with water. Add floating candles to each container. Coordinate the colors with the rest of the table setting. You may want several different looks for your table depending on the occasion or the type of food being served. A buffet or sideboard can be used to store your table décor and serveware. 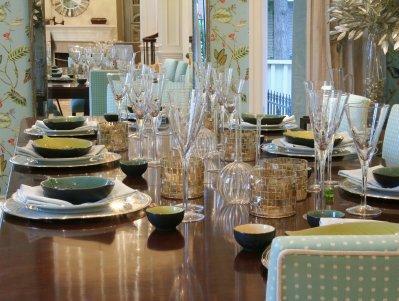 Centerpieces and tableware that complement the style of the dining room can be left on the table for display. Whichever style you choose, the important thing is that the entire table has a truly coordinated look in order for it to be as elegant as possible and impress your guests.